Yuma is in the same grade as the protagonist from a neighboring class and close friends with Manaka. She is very high-strung and aggressive who rides a bike, and for some reason always collides with Takaaki in many embarrassing situations. This is not helped by the fact that she always holds Takaaki at fault, and her attempts to challenge him to duels always end up worse off than they began. 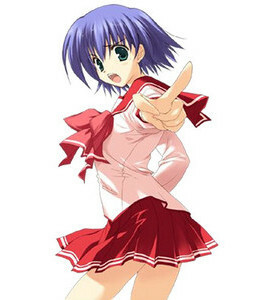 After losing to Takaaki in any way, she often points to him and famously says, "Don't think you've already won this!" She lives in a rich family and is being trained to take over her grandfather's business. "We're just adding "theft" to the list of "intrusion" and "damage to property." So long as we don't kill anyone, it'll be the same whatever we do."